Interdisciplinary artist and composer MV Carbon presents Long Range-Order and the Telekinesisyth as part of her Spring 2015 Residency from the Jerome Foundation. A composition written for piano, processed piano, electronics, tape loops, voice and rotary telephones. This composition will be performed by MV Carbon (electronics, tape machines, piano processing, and voice) and Emily Manzo (piano). A mediated experience which intersects the virtual and the actual. The act is comprised of a performance of a composition written for holographic cello, guzheng and electronics. This composition will be performed by MV Carbon (amplified koto, electronics) and Violet Raid (holographic cello). MV Carbon is a composer, and inter-disciplinary artist. 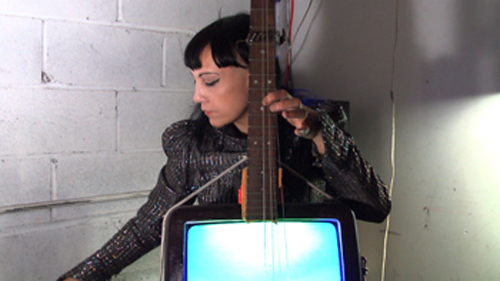 Her work is comprised of video, sculptural objects, sound, hand-built circuitry, projection and performance. Her current explorations deal with communication, illusion, perceptive space, imagination, and interpretation, by way of examining the associations made through imagery and conversation in the context of contemporary culture. Experiential situations are a significant component to her work as she embraces immediacy and investigates the multifaceted layers of sensory perception. Her intention is to objectify emotion through music, costume, sound manipulation, space, and projection. MV Carbon is currently based in Brooklyn, NY. Her extensive exhibition/performance history includes Moma PS1, The Guggenheim BMW Lab, The Metropolitan Museum of Art, Issue Project Room, and The Clocktower Gallery. MV Carbon: Long Range-Order and the Telekinesisynth is made possible with support from Jerome Foundation. The Jerome Foundation, a long-time supporter of young composers, was a mainstay in Roulette’s early development and continues to help us fulfill our mission by presenting ambitious work by promising artists. Each year, the Jerome Foundation supports four artist residencies and five commissions at Roulette. These artists are consistently some of the strongest in our repertoire, and we are delighted to honor the Jerome Foundation’s 50th Anniversary grant.